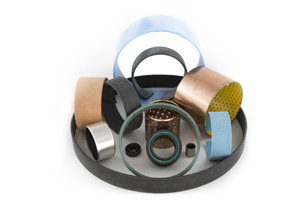 These guiding elements are manufactured from filled PTFE compounds. They are designed to eliminate scoring in hydraulic and pneumatic applications by preventing metal-to-metal contact. Easy to install and economical, they can be used in reciprocating, rotary or oscillating applications. GC-style has been developed to substitute traditional bronze guides in hydraulic cylinders. They guide the rod or the piston and prevent metallic contact with the cylinder when radial forces act perpendicular to the direction of movement. Since GRF guide rings are machined from tube, the thickness can be very precise for high guiding performance. The compound that use these guides is a cotton fabric bound with thermosetting phenolic resin characterized by excellent heavy loads resistance, rigidity, hardness and high service temperature. Similar to the GB-series, this WS-BR60 is the bulk-pack version of the pre-cut GB guiding elements. “DU” bearings are self-lubricating, metal-backed plain bearings with very good wear and friction performance over a wide range of loads, speeds and temperature conditions. They are suitable for linear, oscillating and rotating movements. A stepped cushion seal used to slow down extend and retract speeds at the end of the cylinder stroke, manufactured out of glass-filled Nylon and supplied split for ease of assembly. 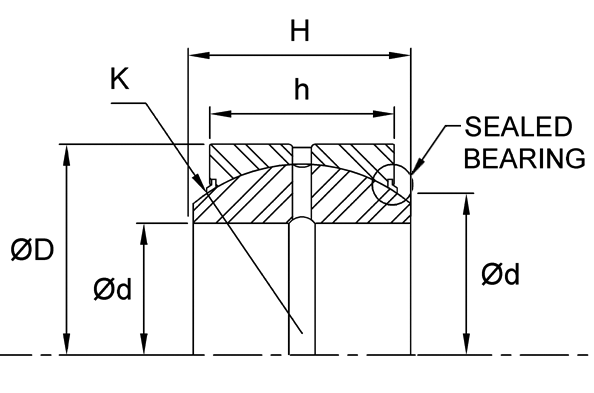 Spherical ball bushings are used to align movements between shaft and housing assemblies, where oscillating, tilting or slewing movements need to be accomodated for at slow sliding speeds. See ES2RS product listing, but with larger housing dimensions.